Every single day of our life is usually spent with the normal day to day chaos of routine things like work, school for the kids, sports, and so forth. 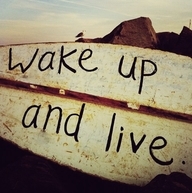 None of us are guaranteed tomorrow so we really need to wake up every morning and just live!! Live in the moment for sure. I know that is very hard for every one of us but imagine what our lives would be like if we did just that!! This is something that i have been trying hard to work on. I am always focused on the what ifs of the next days, weeks, months that i do not really just focus on the day. I really need to try harder at this! When things happen to others it makes us so thankful for our lives, health, jobs, etc. I am totally guilty of this. It infuriates me every time that something happens to someone that i know that gives me a reality check and i always vouch to NOT to continue on living in the future. And that is what brought me back to the present day today. Two people that JJ and i know are dealing with two different illnesses that are very serious. And both of their issues just put that sick feeling in your stomach/weak feeling in your heart and you just want to make things all better for both of them. One of them is a friend that JJ and i have known for a long time but have only seen here and there the past years. She has been diagnosed with a fist size brain tumor and they are operating on her tomorrow. The pathology will depict whether it is cancer or not. She is married and has 2 little boys that depend on her every single day. The other one is a guy that JJ has coached with the past few years. He had knee surgery and ended up developing a clot in his leg that went to his lung. Luckily, he was able to make it back to the hospital when he knew something just wasn't right. JJ visited him today and he told JJ that he literally thought he was dying. And i am sure he did with what was going on. He is very lucky. I ask that you PLEASE pray for both of these young people that deserve every day just like you and i. These are two things that you never want to go through and deal with as a mother, father, husband, wife, sister, brother, daughter, son, aunt, uncle. etc nor do you want anyone else to go through as well. Today has opened my eyes (once again) to the fact that this could be you or i dealing with these unforeseen illnesses. My heart just breaks for these sweet people and their families!! Tomorrow will definitely be a different day for me. I will try much HARDER to focus on living in the present!! Well said!! Thinking and praying for ur friends! !